If there is one statement that we have said over and over (and over!) 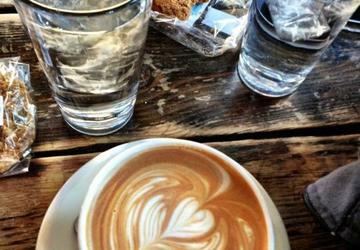 at DC Refined, it's that WE.LOVE.COFFEE! This site probably wouldn't even exist without the help of coffee. And while we all have our own personal favs when it comes to coffee shops, sometimes you find yourself in an unfamiliar neighborhood jonesing for a java fix. Rather than navigating the metro or calling an Uber just to get to your usual joint, why not branch out and learn a few new places around town? 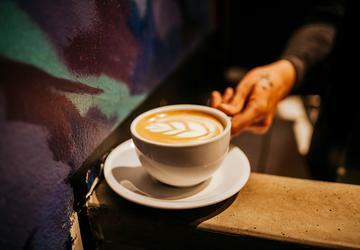 The coffee culture in D.C. has absolutely exploded in recent years, and you are now able to find a well-run local shop in just about every neighborhood in the DMV. 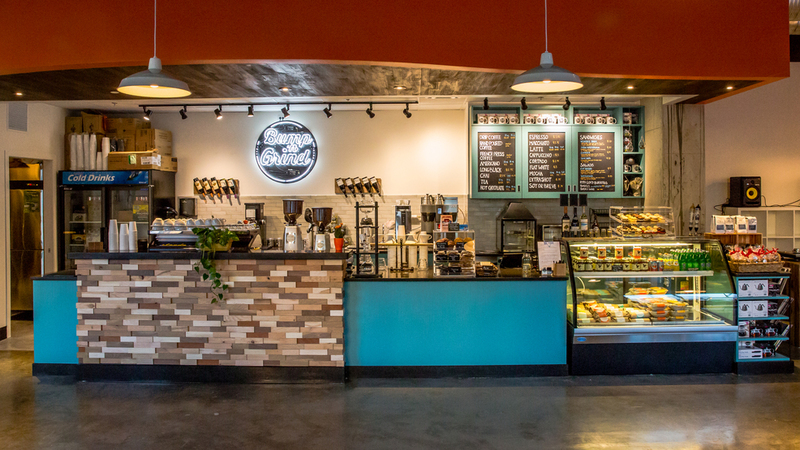 Why we love it: Ok first of all, the area was in definite need of a boutique coffee shop, so we have to give CJ's props for adding a local option to Pentagon City. 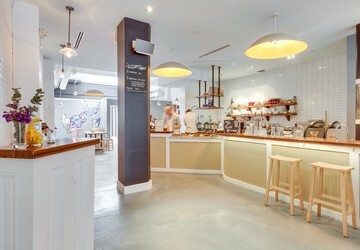 Secondly, everything about this shop exudes warmth, from the modern and airy design to the smiling baristas and the fact that the company started as a mother-son operation! Plus, they host regular "cupping" events which just makes them sound so cool. 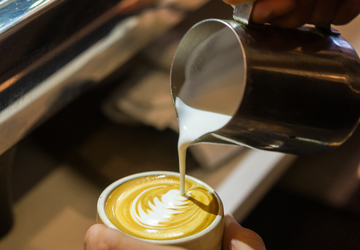 Why we love it: We are a big fan of the all-day cafe concepts, where you can get a great cup of coffee at any point in the day, while also enjoying a few nibbles. And at this creole/cajun restaurant, you can indulge in a taste of the big easy right here in D.C., from beignets to gumbo, muffalottas and everything in between! The comfy chairs and free coffee refills make this a total win in the Courthouse area. Why we love it: We can't help but love the story behind this rapidly expanding franchise, which just announced it would be opening its 8th location at 800 17th Street NW. Two former marines bonded over their love of coffee while on a deployment in Afghanistan. When Harrison and Michael returned from their tour, they started experimenting with different roasts and brewing methods and they realized there were a lot of better options than the bitter, weak, flavorless options they had grown accustomed to in the military. 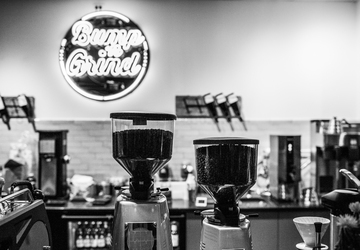 They set out to change that, and Compass Coffee was born. And with everything being roasted and blended in house, this is a great place to geek out over coffee culture, too. 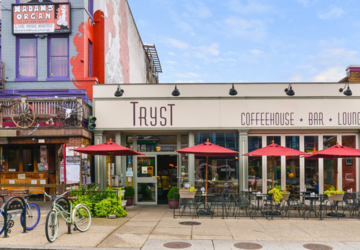 Why we love it: D.C. has a love/hate relationship with most out of town imports, but it has been all googly eyes and hearts since day one with this Philly-based coffee shop. 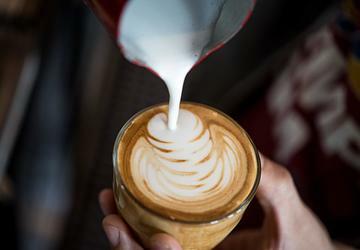 Originally located in Blagden Alley, the franchise has since expanded to four more locations around the District, peddling its famous draft latte -- it's the texture of a hot latte, but refreshing and creamy. The kick of espresso doesn't hurt either! But remember, this isn't a coffee shop to work in, as all La Colombe locations are wifi-free spaces. Why we love it: All true Washingtonians know that there's no point to waiting in line for Georgetown Cupcakes, when you can walk down the street and grab a GIANT cupcake from Baked & Wired without the line -- plus they have a mean cup of java! The vibe is very boho chill, with local artwork decorating the walls, a few mismatched pieces of furniture scattered throughout (seating fills up fast here), but no wifi so bring a book if you plan to hang out. The cafe has its own entrance so if you just need to grab a quick pick-me-up cup and don't want to deal with the throngs of indecisive cupcake lovers, head through the door to the right and order away. But do not sleep on the Hippie Crack -- ya, you know what we're talking about. Why we love it: It's a D.C. rite of passage of sorts to stumble into this tiny shop pre or post Eastern Market scavenging (there are now two other Peregrine Espresso locations in D.C.) and think that you have discovered a true hidden gem -- only to tell your friends all about it and discover that everyone and their mother already knows about the amazingness that is Peregrine Espresso. 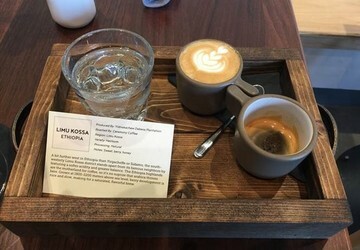 Not that this ever happened to us or anything... Anywho, while the space is small and doesn't really encourage lounging about, the pourover coffee is worth a visit alone! 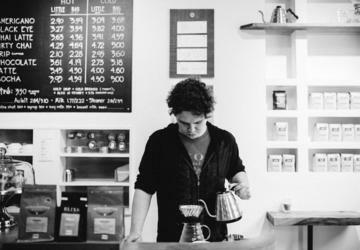 If you're a coffee nerd, definitely engage your barista in a convo about the pour-over process or the bean sourcing-- guarantee you'll learn something new. Why we love it: If only this place was slightly bigger we would totally call this our "Friends" coffee shop -- and finding said coffee shop is basically our life goal. Again, seats are a rare commodity (there is some additional seating upstairs that not many know about, but make sure you get the door code before you trek up), but if you can snag a spot, the vibe is very hipster hangout (except there's no free wifi) with local art adorning the walls, neighborhood-driven art for sale and as one yelper said "this is a serious coffee drinker's coffee shop." Don't treat it like a Starbucks and try to customize everything your way -- no half caf, extra hot soy vanilla lattes with extra whip cream here -- and just rust that the coffee is good as is, on its own. 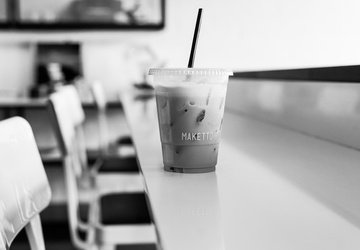 Why we love it: Although Maketto is best known for its innovative take on southeast Asian cuisine, the coffee shop upstairs deserves just as much recognition. The excellent coffee is served in a wide, almost bowl-like cup and comes on a platter that makes you feel fancy. Definitely order the leek buns to snack on too. Why we love it: I mean really, the motto says it all: "no corporate coffee, no matching silverware." Oh, and your coffee comes with a side of animal crackers. If you're looking for a young, chill vibe in a place that is equal parts comfy co-working space and casual environ to meet new friends. 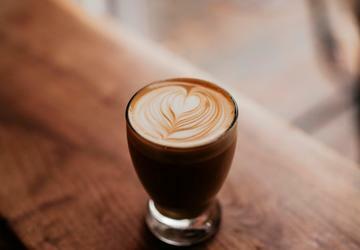 Why we love it: Remember when we said we loved the all-day cafes? Well this is the beauty that turned us on to them! You can literally consume an entire day's worth of meals here -- trust us, we've done it -- and it will be one of the better decisions you make. It was already a fav watering hole for locals, and then its inclusion in last year's Michelin "Bib Gourmand" guide has only increased its popularity. Pop by in the morning for a brioche egg sandwich or an arepa rancheros, washed down with the cold-hearted (chilled espresso, vanilla, steamed milk, cocoa drizzle), then fire up that laptop and get to work; take a break around noon for some pork empanadas and grilled avocado and maybe a caffeine refill-- try a cold brew this time -- and then channel all your energy into finishing out your day's work so you can kick off early and start your evening fun with some housemade vermouth on tap or this week's mule (the featured spirit changes weekly). Soak up a few of these tasty libations with a beef arepa or a friend chicken sandwich, and voila -- you've consumed all of your meals at the delightful Royal. 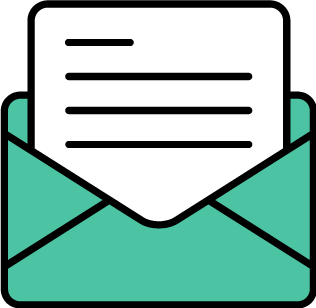 Why we love it: I mean c'mon, that name is just fun to say! While., they are definitely more known for their delicately delicious scoops of gelato, after one 8 a.m. meeting held here, we are total converts to their coffee! 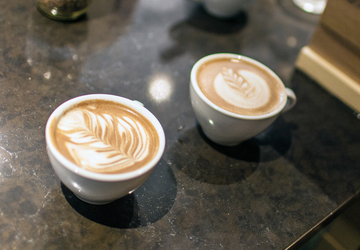 Dolcezza offers at least 4 single origin coffees brewed daily, and they receive fresh roasted beans every Wednesday. Plus, we will forever be thankful to Dolcezza for starting the iced coffee on tap trend! They inject it with nitrous as it comes out, so it drinks like a Guinness. Why we love it: Where else can you get a killer chickpea and harissa hummus toast alongside a house espresso that will knock your socks off?? Leave it to 14th street to have the.best.stuff! 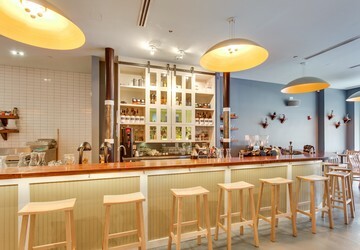 We spent a happy hour here recently and saw so many people on their laptops who were trading in their latte mugs for a glass of white wine and couldn't stop thinking about how genius it was -- a place that has liquid fuel for all hours of the day! 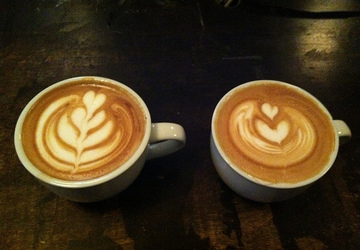 Why we love it: When you walk in Zeke's, you instantly get the feeling that it's all about the coffee here. Just take a look at the "tasting notes" section of their website and you'll see how seriously they take their beans! 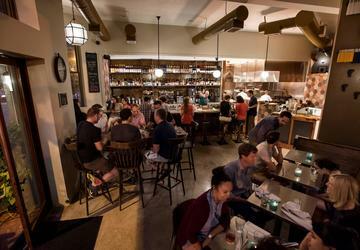 Though Zeke's was founded in Baltimore, they started selling in D.C. proper in 2008 and eventually opened their brick and mortar in the District in 2013. You cab get your java by the Pound, in drip form, espresso, French press, pourover, iced or nitro at this small-batch roaster. 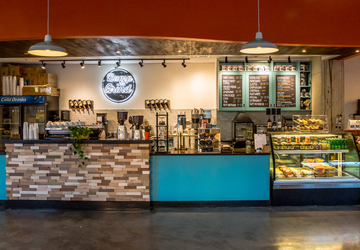 Oh, and grab a kolache on your next visit -- they'll rock your world. 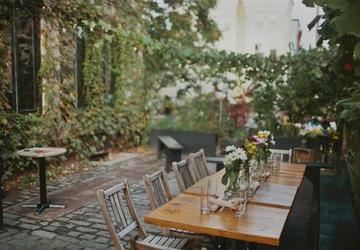 Why we love it: Can we just start by saying that we are obsessed with the decor?? So cute -- feels very 50s diner-esque! You can even listen to some vinyls (and purchase if you like!) before you order. Plus, unlike many of the other selections on this list, the space is quite large with lots of seating and -- gasp -- free wifi! And we are totally loving that you can buy your cold brew in 16 oz growlers here, which produce four 8oz drinks once diluted to a 50/50 ratio with water -- and you can refill your growler anytime.